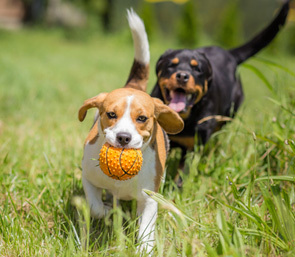 The areas we cover for dog walking include Banstead, Belmont, Burgh Heath, Cheam, Chessington, Ewell, Epsom, Epsom Downs, Hook, Morden, Stoneleigh, Sutton and Worcester Park. Our dog walkers walk a maximum of 6 dogs on our group dog walks and we make sure all dogs on a group walk get along. We offer a solo dog walking service for dogs who require one to one care away from other dogs. This service suits nervous or elderly dogs, or dogs who prefer human companionship. We operate our dog walking services in safe open spaces away from busy roads. We provide a mixture of on and off lead dog walks so that your dog is able to get a good amount of exercise. We will put dogs on their lead if we feel their safety is compromised e.g. a horse is approaching. In order to let your dog off lead we have to obtain written permission for insurance purposes. On our dog walks we always carry poo bags and use treats to aid positive behaviour, such as recall. We collect and drop off your dog. All group dog walking services last for 50-60 minutes. Our standard solo dog walking durations are 30, 45 or 60 minutes long. We can tailor make any walk to suit your dog’s ability. We can collect a set of keys at the initial assessment for free, or we can arrange to collect a key nearer to the service start date. Any keys collected/returned after the initial assessment will be charged at £5 for your pet sitter’s time and fuel. You are more than welcome to drop/collect the keys from us. We provide group and solo dog walking services in Chessington, Epsom and Sutton.